The Blue Ridge Parkway — known as America's Favorite Drive — meanders 469 miles from Shenandoah National Park in northern Virginia to the Great Smoky Mountains National Park in North Carolina. 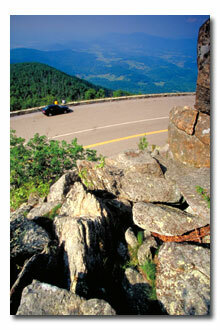 The parkway follows the Appalachian Mountain chain and provides some of the most spectacular scenery in the world, ranging from 650 to 6,000 feet in elevation. A hundred species of trees, a variety of flowering shrubs and wildflowers as well 54 different mammals and 59 species of birds live along the parkway, more than the entire European continent!